Recently evicted from his home, Brian Comer arrived at the ServiceNet Resource Center in Northampton seeking any assistance its staff could provide. “I’m trying to do everything I can get to get back on my feet,” said Comer, explaining that his winter boots were among belongings lost during his eviction. As Comer talked about his situation, Michael Trembley, case coordinator for ServiceNet, took down his information, provided him with a $50 voucher that will allow him to buy clothes at the Salvation Army thrift shop on Route 9 in Hadley, gave him a PVTA bus pass to get there, and assured him that he would be assigned a caseworker. It’s a process Trish Sandstrom is familiar with. She now lives at the Grove Street Inn shelter in Northampton, where she can live around the clock for up to six months. Over the last year Sandstrom has lost her home and temporarily stayed with her father before coming to the resource center. The year-round resource center is housed in the same 43 Center St. building where the Interfaith Winter Shelter will open for the season at 6 p.m. Tuesday. Katie Miernecki, director of the Hampshire County Shelter and Housing Services for ServiceNet, said people are referred to the resource center and required to be assigned to a case manager following intake at the shelter. “One of the requirements to stay at the shelter is to work with a case manager to improve their situation,” Miernecki said. Having a dedicated place for services near the shelter is something that Craig’s Doors: A Home Association, the agency that operates Craig’s Place in Amherst, hopes to replicate. Like Northampton, the only other shelter for homeless individuals in Hampshire County will open for guests Tuesday at 9:30 p.m. at the First Baptist Church, 434 North Pleasant St.
Jade Lovett, shelter director at Craig’s Place, said a trailer, brought to the church parking lot last year to provide early evening meals, is being converted into a daytime resource center that will open immediately after the shelter closes each morning at 8. The new center will be staffed until 3 p.m. daily by members of the Student Advocacy Club at the University of Massachusetts. Lovett’s office is in the trailer, along with a place to store items for guests. But most of the trailer will be for the student advocates, two caseworkers from Eliot Homeless Services, representatives from Soldier On and Health Care for the Homeless, as well as the Amherst Police Crisis Intervention Team that works on the streets. “It will be pretty much a base for all our partners in the area,” Lovett said. The decision to put the trailer to another use came after efforts to use it last season as a meal site. But problems that started on the streets often carried over to the trailer. “The trailer was really good on paper, but it didn’t work well in practice,” Lovett said. In Northampton, the resource center has many of the same agencies engaged, including Eliot and Healthcare for the Homeless, along with a therapist, as well as two outreach workers who serve as clinical case managers, and a housing specialist. Trembley said the resource center is for drop-ins weekdays between 9 a.m. and noon, allowing anyone to get help to access health care, housing and jobs, as well as applying for identifications and disability benefits. “A majority of clients show up here with just the clothes on their back,” Trembley said. As Salvation Army volunteers, both Trembley and Miernecki can provide vouchers for needs, such as clothing. The center is open by appointment 1 to 3 p.m. Tuesdays through Fridays, where each case manager can handle four appointments in a day. The goal is to ensure each person staying at the shelter gets one-on-one attention at least once per week. 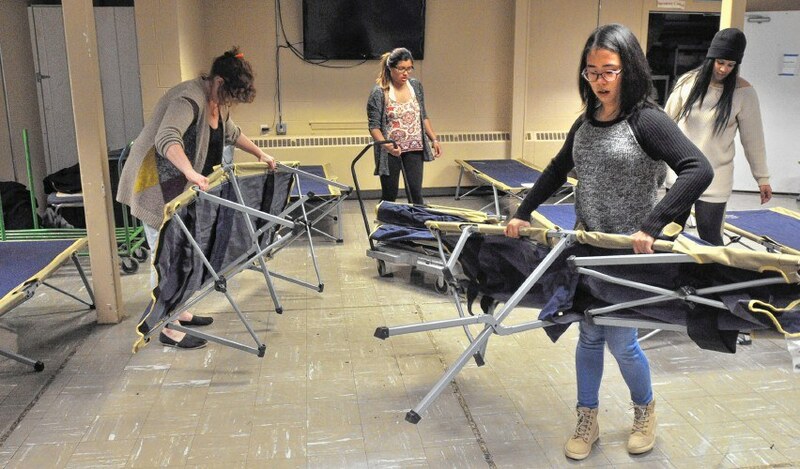 The Northampton shelter will continue to have 20 beds available, with guests lining up outside the door beginning at 5:30 p.m.
Miernecki said the shelter is likely to be at or near capacity on the first night, based on the past two seasons, when only one or two beds were unused on opening night. A similar situation is expected in Amherst. “We’re anticipating we’ll be at capacity right away,” Lovett said. Craig’s Place has 22 beds, but the agency is making an appeal to the town to go over this more often, which is usually only allowed during emergencies, such as large snowstorms and extreme cold. “This ensures we’re adequately staffed at all times, and gives a sense of consistency,” Lovett said. Lovett said 34 beds could be available in the main room and two annex rooms where women are housed. One of these rooms with six beds could be used by those considered most vulnerable. “My proposal is have six beds reserved, but won’t necessarily be used,” Lovett said. After guests enter and check in, they have dinner, but will be split up based on who has a bed, and who doesn’t. Meanwhile, the shelters will continue the same policies. In Northampton, guests must be sober and not under the influence of drugs when they are admitted. They are also limited to how long they can remain, with a cap at about a month. “A guest can have a bed for 30 days as long as they are on time and sober, and as long as they continue to work on goals and objectives,” Miernecki said. In Amherst, the behavior-based entrance policy remains in effect, meaning that guests who are intoxicated or have recently used narcotics, so long as they don’t cause trouble, will not be turned away. There is also no limit on how long they can stay, with those who remain the longest in need of intensive services. “These people are in the community and whether they have a place to stay, they feel safe here, they feel comfortable here,” Lovett said. Craig’s Place remains a so-called wet shelter despite appeals for change from Police Chief Scott Livingstone, members of the business community and Town Meeting member Emelie Hamilton, of Precinct 9. Hamilton recently told the Select Board that Amherst has been negatively affected by some of the guests at the shelter, and that the shelter needs qualified social workers focused on substance abuse. The town, however, doesn’t control decisions about who gets admitted to Craig’s Place because it does not fund the shelter. Instead, Craig’s Place gets a $200,000 state earmark to provide the services. Executive Director Rebekah Wilder said guests include addicts and alcoholics, but any revisions to the entrance policy might have the same people in need. “That mix might change, it might not, if we were a dry shelter,” Wilder said. Any contraband, including alcohol and drugs, will be seized, and is cause for eviction, and staff are able to administer Narcan for those who overdose. “They can be asked to leave for that infraction, so typically they just turn it over,” Wilder said. Amherst Town Manager Paul Bockelman said an initiative led by Community Services and Health Director Julie Federman aims to confront challenges observed among homeless people in town, whether it be with housing, drugs or mental health.